RiverHouse by Bespoke Collection is the destination to experience all things Bespoke. Centrally located in downtown Napa, guests can enjoy wine tasting experiences from Blackbird Vineyards and ÆRENA Wines and the opportunity to acquire Recuerdo Wines, while being surrounded by a curated selection of fine art, antiquities, and objets d’art by ÆRENA Galleries & Gardens. Guests are offered one-of-a-kind concierge service upon request and access to exclusive experiences. Let us help curate your Bespoke Napa Valley experience. We look forward to welcoming you to experience the Blackbird Vineyards and ÆRENA portfolio of wines at our RiverHouse location in downtown Napa. We accept walk-in visitors, although tastings will be offered based on availability. Please click on the reservation links below to request your visit. 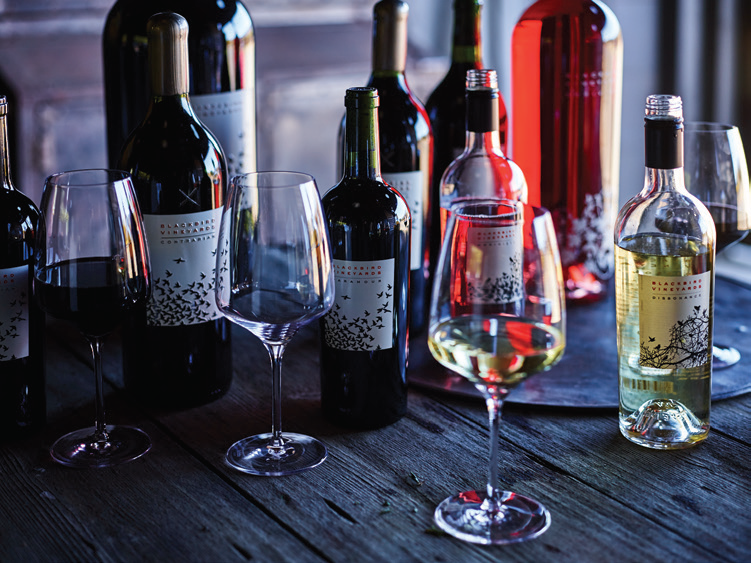 Join us for a portfolio tasting of the entire current and available releases from the Blackbird Vineyards portfolio. Tastings are individually hosted in private and semi-private settings. Offered once per week on Saturdays at 10:00am, we invite Members and non-Members alike to taste the BlackMail wines alongside a specially selected library vintage of Arise and a Principal wine. These four barrel, single varietal bottlings represent the very best expressions of Merlot, Cabernet Franc and Cabernet Sauvignon that goes into the Blackbird blends. Acquisition is limited to Membership. Enjoy Chef Morimoto's eight course Omakase tasting menu paired with the current Blackbird Vineyards portfolio. Bask in classic luxury and unbelievable views for 40 minutes of private flight time in a 1939 Douglas DC-3 with views of Napa and Sonoma Valley, the San Francisco Bay, and the City skyline. Accommodating up to 10 guests, enjoying vintage bottles of Blackbird while soaring above the clouds. Flight departs and returns from Napa Airport. Private charters from partner airports and private tours are available as well. Please call to discuss. View Napa from a privately chartered yacht on the Napa River, touring from Carneros to Downtown Napa. Experience the full portfolio of Blackbird Vineyards wine over lunch with your own host. Offered for groups up to twelve (12) for a three hour seafaring excursion. Begin the evening with a reception featuring Blackbird Vineyards Arriviste Rosé then indulge in Chef Morimoto's eight course Omakase tasting menu paired with premium sake and Blackbird Vineyards library wines. Host your next corporate or private event at RiverHouse by Bespoke Collection! Seated evening wine and food experiences for up to 36 guests and wine receptions for up to 75 guests are available. Our events are fully customizable to meet your needs. On occasional Saturdays, RiverHouse creates communal tasting experiences inspired by vintages, varietals and wines to present a unique thematic tasting opportunity. Email our Concierge for upcoming events and availability. Let our Napa Valley insiders create your own customized wine country experience. Truly personalized to your tastes and desires, our in house Concierge Team can make the impossible, possible.